Hello and welcome to the Sparrow sewalong! 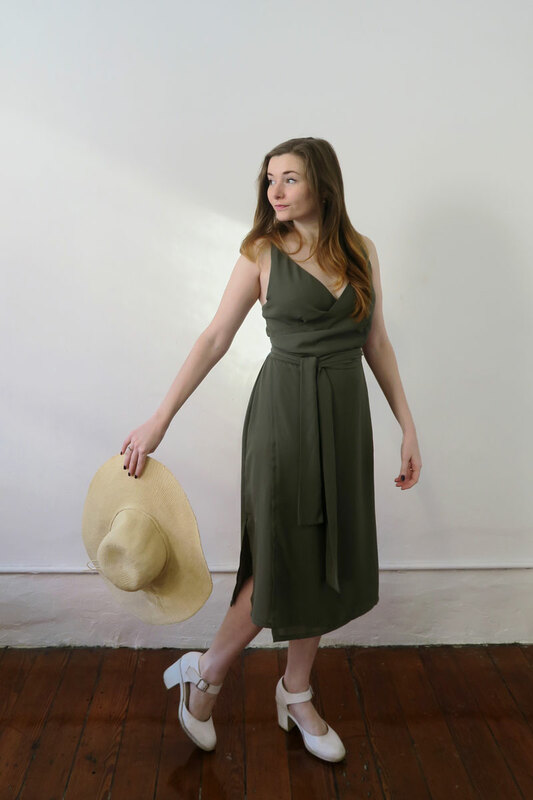 Join me as we dive into the details of making Afternoon's latest pattern: the Sparrow wrap dress. It's a lovely, easy-breezy make for summer, featuring a full wrap-over bodice and skirt, side slits, and a low back. I'll be posting more detailed pictures and explanations of the sewing process, so I hope that this sewalong will guide you and inspire you to sew with confidence. I love this pattern because it honestly only needs the good ol' fashioned basics. The dress is designed to close using ties that feed through a slit in the side seam. No buttons, no zips, no fuss. Lightweight dress fabrics like rayon challis, silk or crepe work best for the Sparrow wrap. The softness really shows off the draped neckline to its full effect. 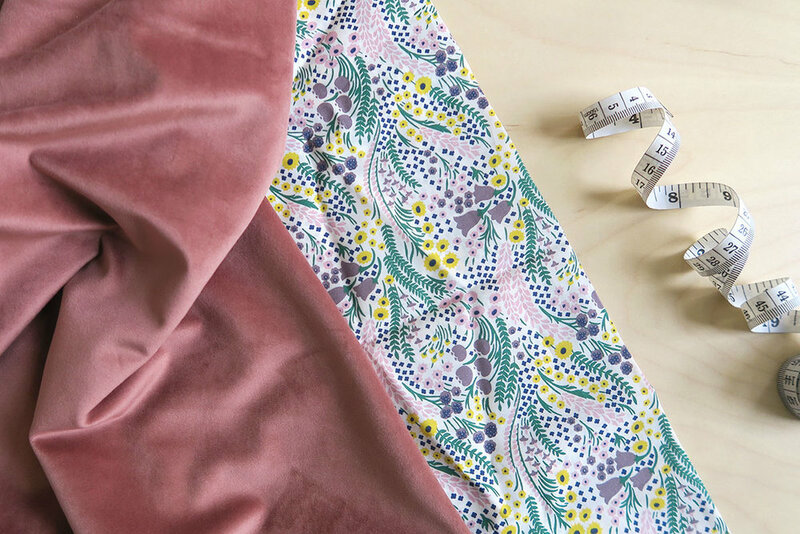 Choose a fun, printed rayon for something beach-ready, or go for a beautiful silk for an elegant evening look. I really like layering the Sparrow wrap over a t-shirt or polo neck for a chillier day, so have a look in your wardrobe to see if you can make it work over a number of combinations. For this sewalong, I'm going to try to make a more wintery Sparrow dress using this luxe-looking velveteen. It's a little left-field, as the fabric is slightly fuller than I would recommend for a floaty wrap dress. But I'm keen to see how it turns out! I wouldn't usually opt to line velveteen dress as the fabric is pretty thick and opaque. However, this is a sewalong, so it's important for the process. And I also have this great Liberty cotton which matches so beautifully and will be light and comfortable against the skin. Once you've found a fabric you love, it's always best prewash it. Most natural fibres shrink in the first wash, and there's little more devastating than only getting one wear out of a new dress! Afternoon uses an alphabetised sizing chart. I think it's easy to become fixated on a preconceived idea of your body size, when the only really important thing is that your clothes fit you... and you feel great in them! Most people will fall across sizes, so it is usually best to choose your size based on your largest measurement. The logic here is that you can always tailor it in a little bit, but once you've cut your fabric, there's no sizing up! Now for the slightly laborious task of collating the pattern. For added convenience, the Sparrow wrap comes with the option to print on A0 paper, as well as the usual A4 and Letter sizes. So if you can get down to the copy shop to print out, I highly recommend it! As always, please remember to select "actual size" when you print (or remind the assistant at the print shop to do so) so that the pattern prints at the correct size. Measure the test square to double check the accuracy of the print before you start cutting your fabric! If you're using the print at home A4 or Letter size pattern, snip along the frames and assemble the pieces row by row, matching A1 to A1, A2 to A2 and so on, keeping in mind that A is the top row, B is the second, etc. Once they're all in order, tape the pieces together, cut your size out and you're ready to start stitching! We've laid some solid ground work for the next step in our Sparrow sewalong. It's not too late to join! Head over to the online shop here or on Etsy and pick one up.